These versatile country buckets are the perfect addition to your next outdoor party. Fill them with ice and a bottle of wine for a practical centerpiece or use them as decorative planters for flowers or herbs. These timeless buckets can be used to display small items at a yard sale or in your home. 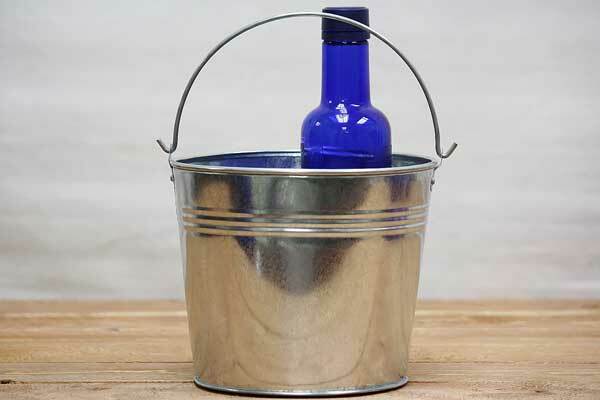 These versatile 3 quart metal buckets feature a decorative wood handle. These country buckets are ideal decorative centerpieces or as small pots to start seeds in. Larger 5 quart wooden-handle country pails and even bigger wooden handle metal pails are available with more space. Can't get enough rustic copper? See our full line of copper buckets and pails here.